Bodybuilding.com Clothing Lift Life Womens Relaxed Jersey Tee at Bodybuilding.com - Best Prices on Lift Life Womens Relaxed Jersey Tee! 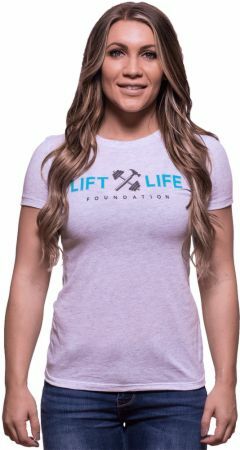 The Bodybuilding.com Lift Life Foundation is improving teens’ health and self-esteem, one amazing weight room remodel at a time! Featuring a soft blend of rayon, cotton, and polyester in a slim cut, this tee is designed to showcase your hard work in the gym. Proceeds from the sale of this tee will benefit the organization that gives kids the equipment and space they need to transform lives — because it’s never too early to become your best self. Chest 33.5" - 35.5" 36" - 38" 38.5" - 40.5" 41" - 43"
XL did not fit my wife, kinda confused what XL means to this company.